SUETONIUS TRANQUILLUS, Gaius. . Scriptores historiae Augustae. Folio (320 x 222 mm), , 786,  pages, printer's woodcut device on title and last page, fine woodcut initials from the Kinderschule. 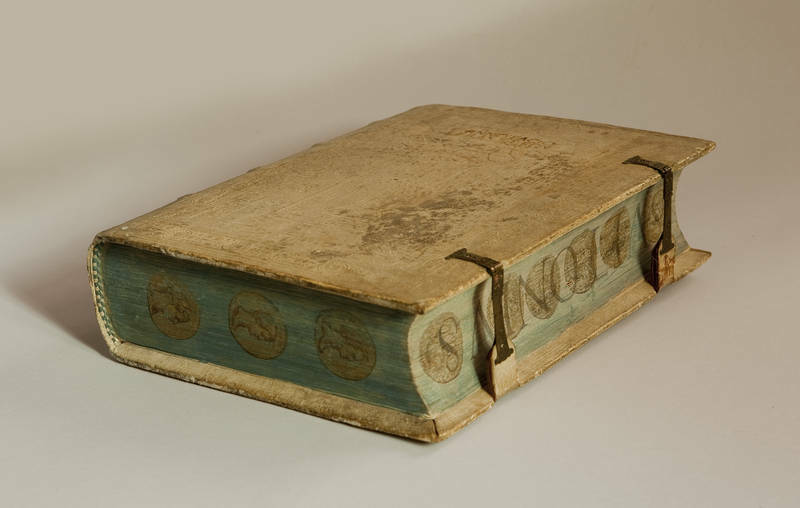 Contemporary Basel binding of blind-tooled pigskin over wooden boards, title in gilt on front cover, brass clasps and catches, from the Pillone library with painted edges by Cesare Vecellio. Edges painted blue with medallion portraits of the twelve Caesars (six on the fore-edge, three each on the other two edges). Provenance: Odorico Pillone (1503-1593, fore-edge painting); Sir Thomas Brooke (1830-1908, bookplate); sold by his heirs in 1957 as part of the Pillone collection to Pierre Beres (catalogue Bibliotheque Pillone, 1957, no. 97); G. Nordback (bookplate). Last gathering with old repairs along gutter, a few foremargins lightly dampstained, decoration on fore-edge lightly faded. A very ne copy. A fine Pillone binding with fore-edge painting by Cesare Vecellio.Th is copy is one of 172 books from the celebrated Pillone library with fore-edge or binding decoration by Titian's cousin Cesare Vecellio (1530-1600). Vecellio's enhancements were commissioned in the 1580s by Odorico Pillone or possibly by his son Giorgio, friends of Vecellio, whose family stemmed from the same valley in the foothills of the Alps, and who mentions the Pillones' collections in his famous costume-book, De gli habiti antichi et moderni (Venice 1590). Vecellio painted the fore-edges of the majority of the books, which are bound in boards, while 21 books are in simple vellum bindings whose covers he and other artists filled with pen-and-ink drawings. Th anks to their unusual decoration and to the fact that the library remained intact until the 1950s, all of the Pillone books have been preserved in their original bindings.This is one of the 59 books in German bindings that Odorico Pillone acquired.This is a fine edition of this collection of texts by ancient Roman historians, incorporating the annotations of Erasmus which were first published in the Froben edition of 1518. Gio- vanni Battista Cipelli (1478-1553), best known under his academic name, Egnatius, edited the work.